Innovation and research are inside our DNA. Besides providing cheap products, we intend to provide solutions to the problems we have been noticing in building sites for years. QS ringlock scaffolding brings out all the qualities that let it become the best product on the marketplace. Here are the leading innovations we introduced. Our walkable steel planks are provided in three widths: 165, 330 and 495 mm, all compatible and inter changeable among them, and five lenghts: 810, 900, 1140, 1800 and 2500 mm. The hook position of our 495 mm plank is very similar to that of the greater part of the planks coming from other Italian manufacturers, so it is often compatible with those that are normally used with prefabricated frame scaffolding. The hooks, except of the smaller between the two in the 165 mm plank, have border ribs that avoid deformations in case of impact, so they could not be deformed during dismantling operations, neither following accidental impacts that take place when the man on the ground escapes the pulley rope. The surface shows three lines of longitudinal holes each 10 mm wide, some with anti slip function and others with water drain function. Planks are perfectly stacked and do not move during transport because upper plank hooks are trapped in those belonging to lower plank. The blocking system used for all our planks consists on a triangle made of wire, with the edges welded together. Each plank has special holes on both edges, each 30 mm wide, useful for easing the lift at height. Planks with trapdoor are provided of total disappearing door, positioned 40 cm back from the edge so that the door could be opened and closed even in presence of end run toeboard. Our standards have rings welded in asymmetric longitudinal position and are provided of spring mobile spigot that could be removed on demand. For example, to assemble a storage platform, after having pulled off the spigots, the timber beams, having a section of 10x10 cm, could be placed straight on the ledgers, so that wooden planks fixed on beams do not find any obstacle. In this way storage platforms of any dimension can be assembled without bulges in the platform. The spigot may be removed also to do shoring, plugging an upside down adjustable jack on the top. In case of need our standards can be used upside down, for example to eliminate the overhangs below an underpass beam or to create a platform at the same height of an attic. The possibility of removing the spigot allows the higher platform get closer to the eave line, avoiding to make additional protections in order to protect people against falling from the roof. Ledgers, transoms, braces and fillers are provided of clamps welded to both edges that are bear a slit sufficiently wide to make it easy and quick coupling with the ring of the standard. The fixing is carried out hitting the wedge, running through the clamp, into the ring holes. In dismantled items, wedges are almost totally leaned back; experts know very well that this condition make assembling and dismantling very fast. Vertical braces can be used both longitudinal either transverse because they are compatible both with platform units either with toeboards belonging to both platforms, upper and lower. 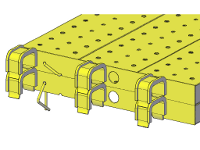 In this way the brace can be assembled between two platforms even in conjunction with the toeboard placed on the lower platform. It is the first brace offering this kind of compatibility. So they can be used to create cantilever stages, assembling it between the walking platform and the lower safety platform without further lower puncheons. In this way cantilever stages can be created also on low buildings located along roads transited by vehicles. With the same braces you can create girders for carriage entrances and increased starts in order to eliminate architectural barriers for physical disabilities, as they can be assembled inside the scaffolding thus, avoiding to create encumbrances on the side nearest to the facade. Horizontal braces, used to stiffen scaffolding in case of particular structural needs, allow the coexistence with platform units. Beams (also called reinforced ledgers) that are used to create wide platforms, have two coupled rods placed bottom side, spaced from uprights welded at constant pitch that strengthen them. With this shape it is avoided any dangerous overhang for anyone passing under the reinforced platform. Our protection fan is the only one that can be assembled even with the external hole already engaged by the lifting tower ledger; in fact the clamp of the QS protection fan element QS can occupy the hole placed at 45°. This particularity allows it to be assembled even in conjunction with a lifting tower linked to the facade scaffolding. By being able of assembling it on both sides of the lifting tower, there are no interruptions in the protection fan. Our toeboards can be assembled in any position and can shape planar concave or convex angles even in coexistence with vertical braces. Fillers are provided of clamps at both longitudinal edges and can be used, as well as to fulfill the space left among platform decks in presence of standards, also as extension of the facade scaffolding platform towards the building thus, avoiding to remain too far from the facade. If used such this way you will always have the same distance from the facade, even in front of standards and it will be much easier to execute construction or restoration works. Through three simple accessories such as stair, left and right thigh supports, using our system you can assemble confortable stairways towers in order to let platforms be more easily accessible to workers needing to carry materials or tools at height. Thigh supports are provided of toeboards and can be assembled in a 90 x 250 cm cell. The difference in height between two landings is always 2 m, the same as the difference in height between two scaffolding platforms. The tower can be assembled outside of the scaffolding, maybe in adherence to the lifting tower in order to access from the building site area to the stairway. 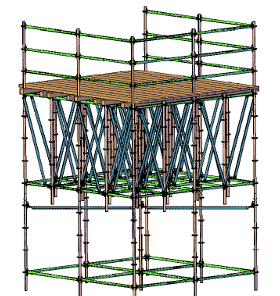 Landings may have any of the available width of the scaffolding: wide, to create lay-bys or narrow, to compress the size in case of scanty areas. Our adjustable jacks are different than usual: through a particular shape of the handle the user can immediately distinguish the upward direction from the downward one. Also the resistence is one of the strengths of our jack: both threads outside the stem either inside the forged handle, are obtained using lathe, ensuring the maximum grade of precision also when galvanized. Metallic crates and boxes coming with QS ring lock scaffolding, were designed in shapes and dimensions in order to maximize the capacity and ease the transport by truck. They are movable both with fork lift either with crane, through four strong hooks placed at sides. They can be stacked up and, unlike many others, do not have lateral projection such as to cause encumbrance during storage and transport. Crates are made in order to stow the maximum quantity of scaffolding items and to save space; this is also valid for standards because our crates are made such in a way that the ring does not interfere with the longitudinal elements of the crate. Security during assembling and dismantling operations is one of the topic we worked on to improve building site productivity. QS ring lock scaffolding is perfectly compatible with Barricate, the only temporary edge protections in compliance with EN 13374 regulation that allow the carrying out of assembling operations in full compliance with safety regulations. Using this collective protection system you can really say goodbye forever to body harnesses, lanyards, verifications of anchor devices, fall clearance calculations, etc. Visit Barricate website to read more about this topic.